First Sorcery! book is available as an iphone app. There was also a re-issue by Wizard books couple of years ago, they're available as a box set on ebay or Amazon fairly cheaply. 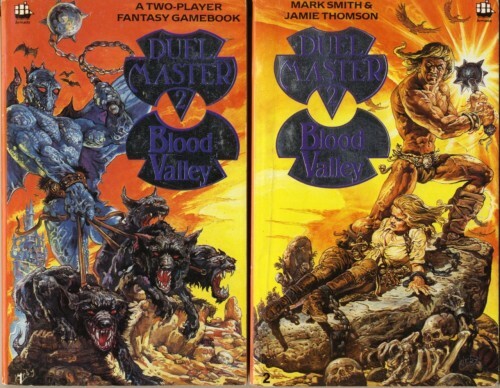 The Sci-Fi Fighting Fantasy's were a bit of a mixed bag in my opinion. Rebel Planet is excellent, does the whole 'rebellion against the evil alien overlords' thing very nicely, Rings of Kether is ok but can be completed in about 20 sections, Space Assassin is interesting but has a couple of bizarre and confusing choices thrown in there (Cephalo Squirrel anyone? ), ditto Star Strider (a boxing match where before you can even start the bloke opens his mouth and disintegrates you with his lazer breath? ), Starship Traveller is a blatant rip off of a number of episodes of Star Trek and Sky Lord is just utterly barmy. Never bought very many as was too busy buying Dr Who and Hardy Boys novels. Favourite was Temple of Terror, though I do remember greatly enjoying one where, literally one decision away from success, I died from plutonium poisoning. Harumpf! I then got into Warhammer, starting with the big grey RolePlay book and later the turn-based table-top campaigns. Didn't realise there were quite so many FF books, either. Sputryk wrote: Never bought very many as was too busy buying Dr Who and Hardy Boys novels. Favourite was Temple of Terror, though I do remember greatly enjoying one where, literally one decision away from success, I died from plutonium poisoning. Harumpf! I then got into Warhammer, starting with the big grey RolePlay book and later the turn-based table-top campaigns. Didn't realise there were quite so many FF books, either. I think Gamebooks were a bit of a 'gateway drug' into things like Warhammer for some people. Not for me though, the nearest Games Workshop was in Wakefield and the people in there freaked me out. I did play Hero Quest and Space Crusade with my mates though. We did Heroquest and Space Hulk too! Made our own system for HQ though based on the FF one and used the board to map out dungeons etc. Then it led to AD&D and then things like Call of Cthulhu and Vampire. Which reminds me: I used to have Advanced Heroquest in the mid-90's. No-one wanted a game so it gathered dust until I gave it away to a nephew who was just starting out in the Warhammer world about 8 years ago. Forgot to mention, Talisman of Death is available on the Playstation Network (which is a bit of an odd choice, as it's not one set in the usual world of Titan) and Warlock of Firetop Mountain was made into a DS game (but weirdly never released in Europe it seems, I had to import it). There's also news that Dave Morris is releasing an app version of his entry in the Fighting Fantasy canon, Keep of the Lich-Lord, which is fun but surprisingly for a Dave Morris book, a bit easy. Tin Man Games new Gamebook Adventures entry, Infinite Universe, should also be on the app store soon. Frustratingly the Fighting Fantasy books on iOS suddenly stopped, including just one out of the Sorcery series of 4 books which was annoying. Was hoping they would release every single book but nope. I've started buying 'Gamebook Adventures' which is basically similar Fighting Fantasy books done by someone else, about 7 of them so far and theyre really good. Theres often a sale on as well (Or they're £2.99 each). I was never interested in these when I was younger, but my older brother loved them, and other similar things. I did get the PSN Talisman Of Death at Christmas and found it to be quite enjoyable. I quite like the ways it shows your percentage of read pages, somewhat encouraging me to make different decisions each time. I still haven't 'finished' it yet either. 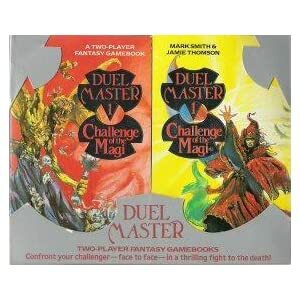 I also picked up Duelmaster, which was a series of 2-player Gamebooks...If you could find someone else willing to sit and read a book with you, it was great fun! The second set in the series was released on the Speccy (and maybe other systems?) as Blood Valley..
Oh and if you like Proteus, I have a link to all the issues available to download as PDF's! The site did have copies of Warlock and The Dark Usurper as well, but the chap in charge removed those at the request of the copyright holders... I won't post the link, as I'm not sure how legit it is for the mags to be there..but if you type in Proteus Magazine to google, it'll only take you a 2nd to find it! The books were supposed to be playable single player too, but didn't really work. Not Smith and Thomsons best works to be fair. The game is utter cack though. Edge left. Hit thing. Edge slightly forward again. Hit thing. Hit thing behind you. Edge forward hit thing. Get totally bored and make mad dash across screeen in hope something more interesting will happen. Die. Reset computer. Throw tape in bin. Treguard wrote: The books were supposed to be playable single player too, but didn't really work. Not Smith and Thomsons best works to be fair. The game is utter cack though. Edge left. Hit thing. Edge slightly forward again. Hit thing. Hit thing behind you. Edge forward hit thing. Get totally bored and make mad dash across screeen in hope something more interesting will happen. Die. Reset computer. Throw tape in bin. *edit: except the tape bit, ofcourse. rainbird rich wrote: I started buying these from the moment they first appeared (sometime in '82 I think) and got the first two dozen or so, then gave up on them as adventure and rpg-style games on the home micros improved. Yes, these were unfortunately rendered pretty worthless by the advances in videogame technology. As a one-player solution for people who just couldn't get any of their friends interested in D&D they were pretty good, though. In fairness, many of them actually have more interesting plots and characters than the early computer RPGs which more-or-less wiped them out. There's been a recent reissuing of the FF titles and of course as mentioned upthread Lone Wolf is still going. So there's obviously still a small but appreciative market for these things. New series do still spring up, Wizard have desperately tried to get new series going with little success,mainly because most of them were terribly written, although the Fantom Empires series had an interesting Victorian steampunk setting, and a credible author in Jon Sutherland, but sadly didn't sell enough to make it past 1 book. The most intersting new series is possibly Michael Wards Destiny Quest which coming full circle is a gamebook inspired by video games, with a decenteralised map where you pick up quests and fight monsters who drop loot to give you combat buffs, and even an online high score table. It unfortunatley makes it a little dull and soulless though. I'm only 26 (27 very shortly) and I have fond memories of many of these books. I have a small collection including Deathtrap Dungeon, Sword of the Samurai, Island of the Lizard King, House of Hell, Phantoms of Fear and a few others. My fondest memories are from the initial posted Robot Commando and my personal favourite, number 54 (I think) Knights of Doom which in my opinion had a fantastic character creation section and cracking read through as well, really difficult too. Good mentions go to City of Thieves and some of the others centered around Port Blacksand! RetroMartin wrote: Good mentions go to City of Thieves and some of the others centered around Port Blacksand!